This mammoth IPA is dry-hopped to the gills, delivering a kick-you-in-the-teeth hop chop. This beer is unfiltered, as with all SweetWater's brews, to leave all the natural flavors intact. On draft. The bartender told me Sweetwater does a lot with fruity undertones with their beer. He then told me the IPA had grapefruit undertones - which struck me as cliche... Until I tried it! Fantastic - assuming you like grapefruit! A great novel IPA variety! Pours a dark orange haze, darker than most in this style. Extensive lacing and slightly off white head. Smell is subdued for the style, some citrus and sweetness. The taste is remarkably well balanced for an American IPA. Citrus hops with a solid malt backbone. No residual bitterness in the finish. With the low carbonation medium body and almost perfect hop to malt balance...this is the most drinkable 6%+ IPA I've had. The best of the Sweetwater bunch. An okay iPad. Nothing special and won't buy again. The brewery states that it's unfiltered, unpasteurized, with an intense hop character. Crafty sounding to say the least. Sunrise orange hue, nearly crystal clear. The froth clings well. Sticky sweet pink grapefruit with some herbal and wild flower aromas form the hops. Not a whole lot of malt in the nose as the hops are clearly dominant. Exceptionally smooth with a creamy medium body. The prickly sharpness from the hop bitterness needles the taste buds with a clean, spicy character. Heavy and deep herbal and citric rind flavor wrings out the taste buds with each sip. Spikes of malt pop up here and there with dry biscuity flavors, alcohol drops a clean fruitiness that resembles pears and Red Delicious apples. Puckering dry finish with a long dragging trail of hoppiness. The label deceives, or perhaps we were not ready for the hop onslaught that was delivered from this bottle. A hophead's beery dream. Without a doubt this a good call when it comes to American IPAs. Very good! smooth, tasty and EZ to drink more than a few. My wife even likes it and it makes her britches disappear!! pours a cloudy amber with a solid head. smell is sweet, nothing very noticeable going on here. not bad but not great either. for a 6.3% beer this has a nice hop bite. i'm pleasantly surprised by this. crisp bitterness and finishes with some lingering bitterness. this is actually pretty good. my first SweetWater Beer as they just came to NJ recently. low-ish in abv but a full IPA flavor. 12oz bottle bb 9/24/17 poured into a Spiegelau IPA glass at fridge temp 6.3% ABV. The beer pours a somewhat bright honey amber color with off white head and quite a bit of lacing. The aroma is citrus and pine with a hint of caramel. Old school and solid but not overpowering. The taste is more citrus and pine with some caramel malt in the finish. The bitterness is subtle but there. Mouthfeel is soft bodied with moderately high carbonation. The finish is undry, possibly a combo of hop oils and malt. Overall, very good. I don't know for certain the age of this beer but I imagine the experience might have been better fresher. An old school IPA with promise. Appearance- A pretty bright honey amber with a very steady and strong column of bubbles ascending to the heaven that is my palate. Leaving behind almost a finger worth of foam and lacing. Great beer to look at in wonder. Smell- A mild hop aroma for an American IPA. Plenty oof bittersweet bread crust aromas. Lots o biscuit dough. Taste- Some orange peel mixes with the toasty malts to give it a burnt orange peel hopp flavor. Clean hop presence. Not resiny or syrupy. Almost like a lager with IPA flavors. Outstanding brew. I was immediately pleased by the orange/yellow color which was very inviting. Medium head and but not too frothy. I love the taste of this beer, somewhat light with distinct notes of citrus, and it leaves a delightful sizzle on the back of your tongue many moments after consumption. If I had to complain about anything it would be the body which I would prefer to be a little more robust. Overall, f*cking outstanding beer! This is now my go-to favorite, and it will take a hell of a contender to knock it off the throne. Bottle best by 6-28-17; just over! DFH Tulip. A: pours a rusty copper orange with 1 finger white head that recedes to a nice thick skim with a ring of bubbles. Lots of visible carbonation. Good lacing and excellent retention. S: delightful sweet citrus. Very traditional IPA, nothing over the top. T: much like the aroma, sweet and citrusy arrival; ruby red grapefruit, navel orange peel. Mid palate is bready and not too sweet, but sweeter than most IPAs you find these days. Ending is lightly bitter. Training wheels IBUs, which suits my taste just fine, thank you very much. M: lighter end of midweight, active carbonation, and significant but not unpleasant slickness. 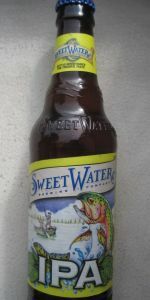 O: Sweetwater Blue and 420 were some of the first craft beers I ever had. I don't know why it took me 15 years to get around to drinking this one. This is a really satisfying IPA. It does not push the envelope; this represents the outer limits circa 2003. But this flavor profile is solid and really enjoyable, and getting harder to find. Brewers who have been at it for this long can really fine tune a beer, and this has perfect pitch. This is a great classic IPA, even two days after its best by date, and is worth giving a try. Very citrusy, floral tones and a nice aftertaste. Had in Destin, FL SB 2017. At 7% this would seem to be a new and great session brew. Very flavorful, nice job Atlanta, if only your highways were as smooth! Taste: I generally don't like IPAs but this is honestly a perfect balance of citrus and bitter hops. I think it's the best IPA I've ever tasted. Overall: This is my favorite standard IPA (i.e. no added flavors like Mocha or Grapefruit) ever! BItter, tasty, easy to drink, clean beer. Not too dank. I am sure I am higher than the average on this beer but it just does it for me. And the price point is great. I get 6 = 16 ounce cans for $8.99. My favorite IPA. The smell is phenomenal; very floral. The best smelling brew I've had the pleasure to sniff. The taste is very similar to the scent. Perfect amount of bitterness. Superbly balanced. Simply good stuff. Overall: very nice beer, leaves you wanting more! I found the smell of the beer very attractive, it takes me back to working in the drying kiln on a hop farm many years ago, that peculiar and distinctive hop smell. What to say? Man North Carolina, you're killing me! I know this is a Georgia IPA, but trying to locate a good IPA in these parts is becoming a daunting challenge. Can't blame the date on the bottle, drink before August 14, it's June 21st. This IPA looked beautiful as I was pouring it, but appearance tells you little. Upon smelling it, nothing. Second try, I may have dug out some piney notes. Taste- Just bad off flavors. Would have rather had a Bud. Poured it out. Hopefully, this was a "bad" batch, but with the date and my luck with the East Coast IPA'S, I am losing hope. Thankfully, I can still get Lagunitas out here. I do not understand the strong ratings for this one. There is not a lot of there, there -- mouth feel, flavor, nothing offensive but entirely "eh". Won't get again. Pours hazy orange, string notes of pine and floral off the nose. Followed up by slightly bitter and earthy tasting notes. Overall a smooth and easy drinker, a classic IPA and good introductory beer for the style for new consumers. After the new brewery opened, Sweetwater IPA has taken a turn for the worse. What was once a cloudy, gritty, hoppy, exciting beer, has now turned into a clear bodied, timid little IPA. Not a bad beer, but not as good as it used to be. I wish they would go back to the old formula, or better yet brew a Double IPA for the adventurous types. 12 ounce bottle out of the tacklebox sampler. The biggest hit out of the sampler in my opinion. Poured into a pint glass. The Sweetwater IPA pours a hazy orange color with a frothy 2 finger head that has great retention. Some noticeable sediment is seen in this unfiltered brew. Aromas are grainy and sugary. Lots of sweetness that far outweighs the hoppiness. Some malts are also present. Taste is also somewhat sweeter than I expected. I actually enjoy the sweetness to it, there isn't much bitterness at all. Some fruit is also present in the taste. Mouthfeel is thin bodied and smooth. Drinkability is pretty good for this. ABV is mediocre and the taste was a pleasant suprise. nice golden haze hue and cloud white head, small bubbles, leaves a little lacing. smells like uber sweet, juicy fresh hops.... sooo good. this to me is the epitome of a solid smelling ipa, good things are to come. nectar of gods. its the almost perfect balance of massive hops, pineiness, and citrus. i really cant think of it getting much better, and i find myself thinking fondly of pliny. west coast claims the best ipas and this east coast monster has to run with the best of them. the dry hopping pokes through on the end and the bitterness is mild, just the right amount. i wish i had access to this beer on a regular basis, although if i did, i may drink nothing else... ever. drinkability and mouthfeel are perfect, and i wouldnt change a thing. A: Big white head sits on the semi-clear orange beer. The head shows very good retention and excellent lace. S: Aromas start with a big hoppy nose of citrus and floral hops. Also has some tropical fruit smells. T: Starts with a sharp hop bitterness, with citrus fruit like grapefruit and oranges. Other flavors include tropical fruits and some malt sweetness in the background. M: High carbonation on the feel, with a medium body. The beer finishes fairly bitter from the hops, but has some malts as well for balance. O: Excellent example of an American IPA!